Howard Sandberg is the owner of CBS, also known as Coatings by Sandberg which produces the best dichroic glass in the art glass industry. Love their dichro!! 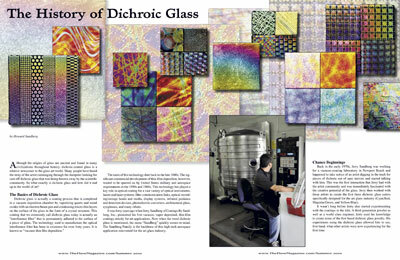 So Howard has written an article for the newest issue of The Flow and you can download a pdf of it to learn more about dichroic glass. I am fortunate that CBS is located in Anaheim, CA which isn’t that far from where I live, so I’ve had the pleasure of witnessing the magic of the coating process in person. It’s science man…the process is done in vacuum chambers and the glass spins around inside the top of the chamber. There are screens that are used to create patterns that are fabulous rainbows of color. And some is just solid color. It’s just awesome. I’m a big fan of dichroic glass, obviously. So check out the article and check out The Flow, which is full of more interesting articles. Not only is Sandberg’s glass the finest, their museum of dichroic glass is the best collection of dichro works in the world, truly awesome. And as if that weren’t enough, it is a family owned and operated business that looks out for its retailers, hosts excellent classes and instructors and is continually developing new applications for the technology of dichroic. Simply, the BEST!